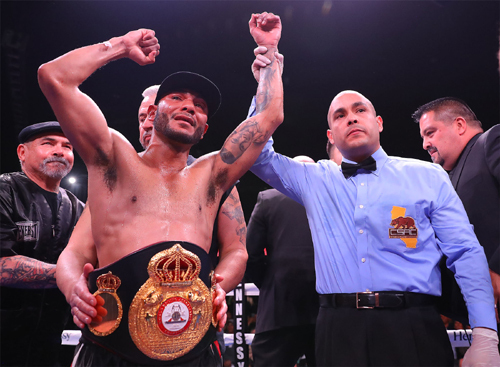 Andrew Cancio (20-4-2, 15 KOs) of Blythe, Calif. scored an upset victory over Alberto Machado (21-1, 17 KOs) of San Juan, Puerto Rico in front of a sold-out crowd of hometown fans at Fantasy Springs Resort Casino to become the new WBA Super Featherweight World Champion. 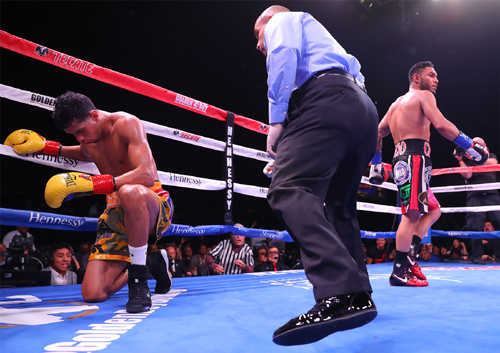 Cancio, who himself was dropped in the first round, scored three knockdowns over Machado, forcing the fight to be stopped at 2:16 of the fourth round. The fight was streamed live on DAZN. 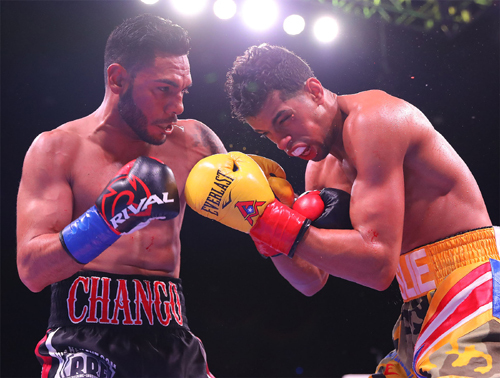 "This was the fight of my life," said Andrew Cancio. "I feel extremely great winning this world title by knockout. I did not let this fight go to the judges' scorecards. It's been a long road, and it felt like we thought it would: unbelievable. For me to execute a plan like we did feels great. He caught me early, but it was a flash knockdown. I got my legs back and got my composure. I was never out of the fight. I'm extremely happy." "I felt weak in there," said Alberto Machado. "The rematch would be nice, but I think I have to move up to 130 pounds. We will see." 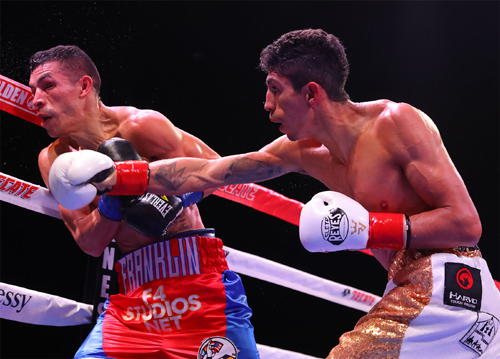 Rey Vargas (33-0, 22 KOs) of Mexico City, Mexico defeated Franklin Manzanilla (18-5, 17 KOs) of Caracas, Venezuela via unanimous decision to retain his WBC Super Bantamweight World Title. 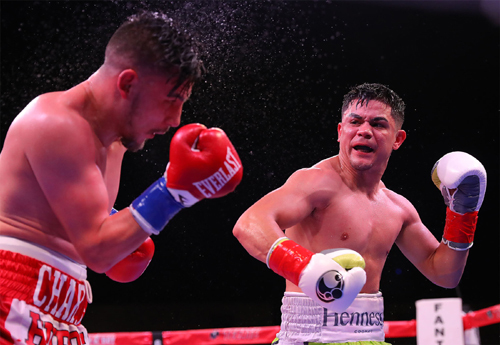 Vargas won with three scores of 117-108. 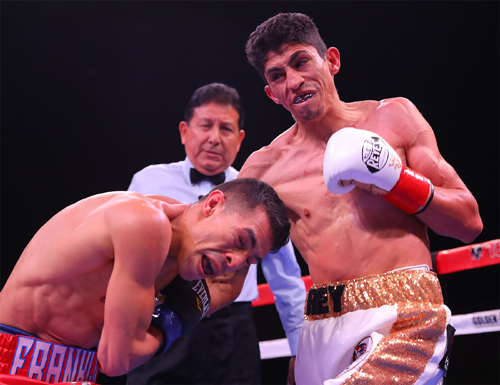 "I feel good but he fought too dirty," said Rey Vargas. "I like to fight clean, not dirty like he did. It was a complicated and he's tough. But I adjusted to his style, and that's how I won. I wished he would have fought cleaner, but I did what I could." "I felt uncomfortable because he was taller than me, said Franklin Manzanilla. "I haven't fought anyone that tall before. I hurt him in the second round and I tried to continue that momentum. I feel I did well." 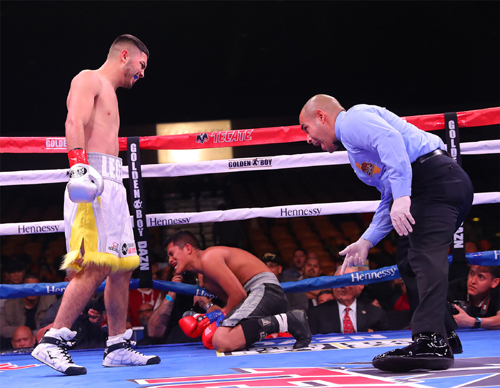 Joseph Diaz (28-1, 14 KOs) of South El Monte, Calif. defeated Charles Huerta (20-6, 12 KOs) of Paramount, Calif. via unanimous decision in a ten-round super featherweight battle. Diaz won with three score of 99-91. "I did really good," said Joseph Diaz. "I moved up in weight and showcased in this new 130-pound division. I was able to look good and push back a super featherweight in Huerta. I had him hurt a few times, but I couldn't finish him because he's such a warrior. At the end of the day, I had to do my job and that's what I did." "It was the right decision," said Charles Huerta. "Besides the first round, I took the pedal off the gas. I waited too much. He countered me well, and I let him dictate the pace. I had a 17-month layoff, and I feel I did well. I hope I come back for another opportunity soon." 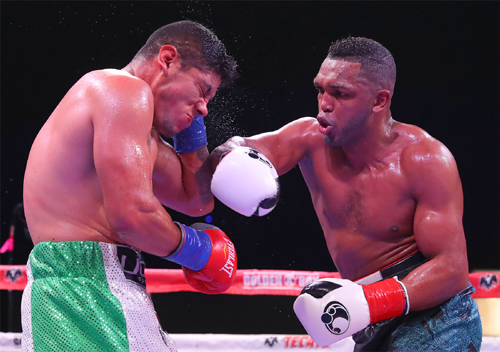 Adrian Estrella (29-3, 24 KOs) of Nuevo Leon, Mexico defeated Oscar Duarte (15-1-1, 10 KOs) of Parral, Mexico via majority decision for the vacant WBC Continental Americas Lightweight Title in a ten-round fight. 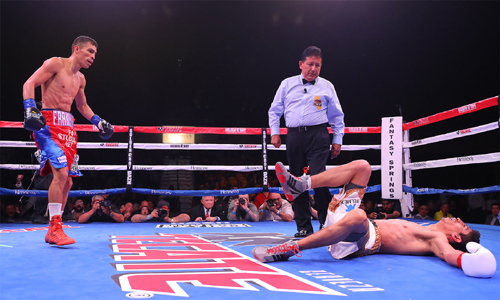 Two judges scored the fight 96-94 and 98-92 in favor of Estrella, while one judge scored it 96-94 in favor of Duarte. "This is something I've worked hard to get for many years," said Adrian Estrella. "Working my distance was key in this fight. It's hard to knockout Oscar Duarte. And he was getting stronger in every round. So, I decided to jab and work the distance. I got a split decision, but that's okay. As long as I get the win, that's fine with me." "I don't think the decision was right," said Oscar Duarte. "I thought it was a draw. I was pressuring the whole time. I feel I need to learn a lot more." "I want to thank God for this opportunity," said Tureano Johnson. I want to thank Golden Boy and DAZN. He [Castaneda] did an awesome job. It is a disappointment for me, but now I'm looking for bigger and better things. It wasn't me overlooking him. My corner was there. I didn't execute the way I should have. I wasn't listening to my corner. Next time I will do better. Tureano will be back." 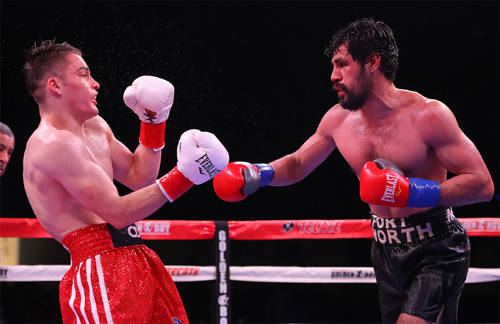 "We did a good fight," said Fernando Castaneda. "It was against a fighter without a lot of experience. I want a rematch because I did a good job. I worked him to the body and wore him down. I want to thank Golden Boy for this opportunity." 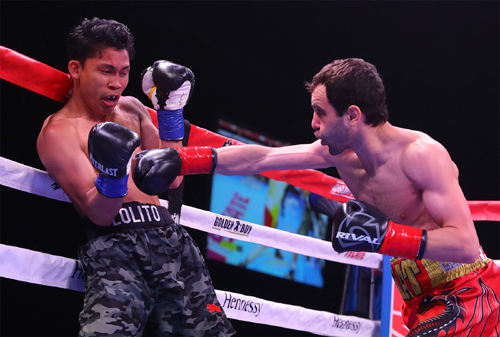 Azat Hovhannisyan (16-3, 13 KOs) of Los Angeles, Calif. defeated Lolito Sonsona (22-3-4, 9 KOs) of General Santos City, Philippines via KO in the fifth round of a super bantamweight bout originally scheduled for 10 rounds. Azat Hovhannisyan won with a time of 2:30 of the aforementioned round. "I feel good about the fight," said Azat Hovhannisyan. "I trained hard for this fight. I'm surprised [Sonsona] prepared so well. I wish I could have looked better, but a win is a win and a knockout is a knockout. I hope to look better next time!" 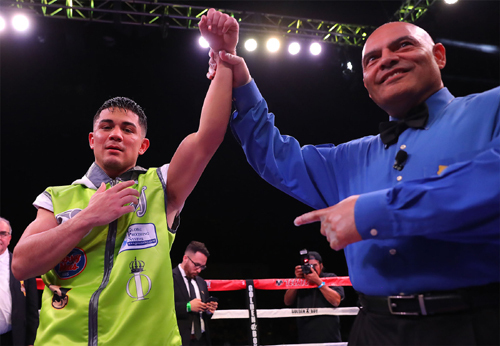 Rommel Caballero (5-0, 4 KOs) of Coachella, Calif. defeated Javier Rojas (1-3, 1 KOs) of Mexicali, Mexico via knockout in the first round of a super featherweight fight originally slated for four rounds. Caballero won with time of 1:58 of the first round. "It feels great coming back," said Rommel Caballero. "I'm back doing what I love and what I do best: boxing. I want to dedicate this fight to an important person who passed away, Marcos Brambila."